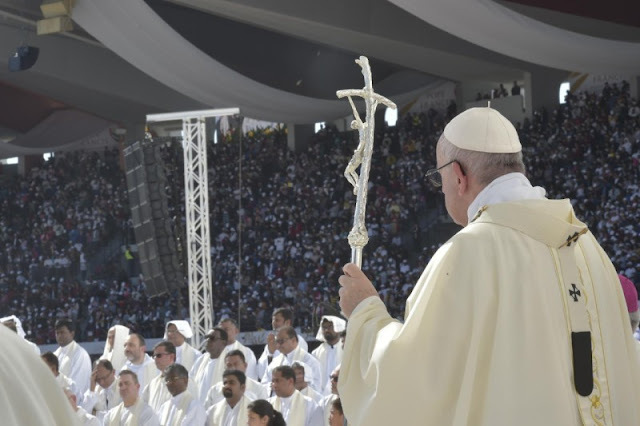 Pope Francis celebrates Mass in Abu Dhabi's Zayed Sports City on Tuesday, the last day of his Apostolic Journey to the United Arab Emirates. The full text of his homily is below. At the end of the Eucharistic Celebration, the Holy Father greeted all those present before proceeding to the airport for his flight back to Rome. Before concluding this celebration, which has been a source of great joy to me, I wish to extend my affectionate greeting to all of you who have participated; the Chaldean, Coptic, Greek-Catholic, Greek-Melchite, Latin, Maronite, Syro-Catholic, Syro-Malabar and the Syro-Malankara faithful. I sincerely thank Bishop Hinder for the preparations of this visit and for all his pastoral work. A warm thanks also to the Patriarchs, Major Archbishops and all the other Bishops present, to the priests, consecrated persons and to so many lay faithful who are deeply committed, with generosity and a spirit of service, to their communities and to the poorest.